As you all know by now, I am a Social Worker and my specialty is poverty and homelessness. My career interest started with homelessness, then I learned the connection to poverty. People often ask me questions about homelessness, what are the causes, what are the solutions, should they give money to the people they see on the street, do the people on the street know where to go for help, are all homeless people on drugs, and so on??? Many people also have pre-determined judgements about the homeless – they all chose to be on the street, they are all alcoholics or drug users, they made bad decisions and caused their own homelessness, they are all lazy, they are heathens and need to find God, etc. Then there are people on the opposite extreme – homeless people are completely innocent and have done absolutely NOTHING to cause their situation, all homeless people are victims of a capitalist society, people who are homeless are the same as everyone else and the only difference is a lack of money, all homeless people are sweet and innocent as pie and we as society should give them everything they need, and it is the government’s responsibility to help all homeless people with housing and resources because well……the government caused this problem anyway, so they should fix it! As with most subjects, I understand the reasoning on both sides and my personal belief is in the middle. I try to have balance in all things. I particularly try to stay away from extremes, because extremes cause stereotypes, misunderstandings, fear, and hatred. 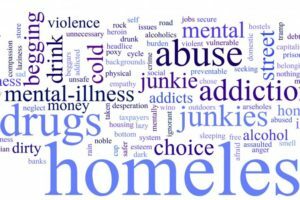 Homeless people are just that…..people, human beings, and as such they are a group that has a variety of different experiences and reasons that led to their experience of homelessness. Notice that I said “experience of homelessness.” Their entire existence and life story isn’t about being homeless; it is just one experience in their life. Albeit a vital one because our home is the foundation of stability for most people, but it is still not the totality of their life experience. Just like any other group, people who are experiencing homelessness, have a variety of reasons which brought them to this point. Some are substance users, some are not. Some are lazy, some are hard working. Some choose to be homeless and cannot (or will not) conform to norms of society. Some are fighting it with every ounce of their being, and WILL one day be stable and successful. Some made poor life decisions, some did not. Some “knew” they were making poor decisions, while some did not know their choices were not positive and/or productive because they were never taught. Some believe in God, some do not. Some believe in God, but have lost hope. Some have strong faith and hope. Some were victims of a heartless big corporate giant and had everything stripped from them. While some have never had stable employment at all. Some never had the opportunity for education and employment and are victims of the dark side of society as a whole. Some……in this case I will say MANY had parents who did not instill, teach, or steer them towards the opportunities in education and employment that do exist. Usually because they didn’t know themselves. Some had no parents. They may have been raised in foster care or by other family members. Some had parents that were physically present, but mentally and emotionally absent. Some experienced a life altering change which caused them to lose everything and become homeless, such as divorce, job loss, physical illness, mental health break, or death of a loved one. Some are veterans and after they fought for our country, came home to no jobs. Some of them also suffer from PTSD, which makes it hard to function in “normal” society. 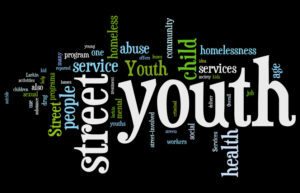 Youth who age out of foster care. After reaching the age of maturity, the state stops care and they find themselves all alone, broke, and homeless. I have a question for you: those of you who had parents and a solid upbringing, did you know everything you needed to know in life and were able to fully provide for yourself at the age of 18? Lesbian, Gay, Bi-Sexual, Transgender (LGBT) youth. This group has a very high rate of sexual abuse and assault, and many find themselves having to prostitute in order to survive. Veterans. As noted above, many veterans come home from service and cannot find employment, which means they can’t afford housing. Some have physical illnesses and some have mental illnesses caused by their traumatic experiences in service. I have heard people say “well they have veteran services, so they have help.” Well just like most social ills, yes there are services, but they are over capacity. There are many people working hard to help this population, but the need is even greater. Substance abusers. Ahhh the group that everyone loves to hate. Yes, there are people who are homeless who are substance abusers. Some were already users and it caused their homelessness, and some became users because of their homelessness and vulnerability. It can go either way. Addiction is a disease, one that many people struggle with. Let’s also note that many people who are not homeless struggle with addiction. How many celebrities do we hear about who use substances, some even glorify it. But when you do not have the money to support your habit, the outcome is different. We all know the quintessential example of the rich executives whose children use drugs, go into expensive re-habs and then end up running a million-dollar business. So, in fairness I want to acknowledge that people who have housing, even mansions, suffer with substance issues as well. The Mentally Ill. Now this would be a group that I would say the government has some obligation. It is not the governments fault that people have mental illness, but this is a vulnerable group in our society who do not have the mental capacity to care for themselves. If you have an extreme mental illness and you have no family support, then you are in big trouble. Just as with veterans, yes there are mental health services, but again the need is greater than the services available. In addition, the available services do not necessarily meet the realistic needs of the population. In Michigan our mental health facilities were defunded and closed some years ago. As a result, many of those individuals are now homeless. This population often has what is called a dual diagnosis, and that means their mental illness is coupled with substance use or another type of disorder. Poverty. This is the broadest category. It could include the other categories, or it may stand on its own. People in poverty face multiple cycles of homelessness among other common factors. This would be the group that most would say are homeless because of their decisions. This group also includes children of homeless families. At the shelter I work at, we have up to 100 children at any given time. And just think, we are only one shelter in Detroit. Finally, I want to clarify that homeless does not automatically mean “on the streets.” That is the stereotype, the man holding the sign at the freeway exit, the woman pushing the shopping cart with everything she owns in it, and the people sleeping under the bridge. Everyone that is homeless is not literally on the streets. Some live with family in very uncomfortable and dysfunctional situations. Some couch-surf, meaning sleeping on the couch of different people for very short periods of time. You may find many youth couch surfing. They stay with a different friend each night, until they wear out their welcome or some confrontation ensues (which undoubtedly will) and then they are off to the next. Some shelter hop, meaning they go around from shelter to shelter staying for the 90-day limit, and then go to another – families tend to shelter hop. They may even go to different cities and states as they exhaust all options in each one. Many also cycle in and out of housing programs. They obtain housing, then lose it; obtain again, then lose it again. None of these groups are actually on the “street” but they are unstable, poor, and homeless. Notice I only gave a general description for each homeless category, I didn’t get into solutions. Why? Because that is too much for this brief posting. Even one group could take an entire book (actually multiple) to identify solutions. That is why most people in Social Work, Psychology, Mental Health, Family Services, etc. have a specialty because it takes a lifetime of dedication to help even one of these groups. My goal today was to give some general education for people who want to understand homelessness a little better – and to inform people that homelessness is so much more than the man holding the sign at the freeway exit. The next time you feel the urge to judge, just remember it could have been you. Thank God for the mercy and grace that He bestowed upon you. I truly thank Him for the mercy and grace He gave me, if not……. there but for the grace of God go I. Thank you DaNietra for bringing this article to my attention. Just recently I encountered a gentleman who is homeless and voiced my concern on FB about the many “Christians” who simply have walked past him without helping him. I never want to be guilty of not doing whatever I can for another human being. Awesome post! Thank you for sharing your wisdom and knowledge!